One minute he is on the fairway, the next he is in the trees. One day he is looking after his own golf swing, the next day he is auditioning swing coaches. One week he is missing the Ryder Cup, the next he wants to play in it. In an uncertain world these days the only certainty is that Tiger Woods is uncertain about virtually everything, although the world No1 did take the opportunity today to shine a little light on the life of the organisers at Celtic Manor by stating his intention to make the trip to Wales. "Yes," he said baldly when asked if he would accept a captain's pick from Corey Pavin, in stark contrast to his answer to the same question at Firestone last week which was notable for its equivocation. "No, I haven't seen him [Pavin] and hopefully I won't be a pick. I would like to play myself on to the team." It is a measure of how far Woods has fallen that he has yet to play himself into one of the eight automatic spots on the US team – he lies 10th in the points list. While Pavin will almost assuredly pick him, the US captain would also surely be justified in any decision to leave him at home. Such issues will, of course, be moot if Woods conjures up a good finish at the PGA Championship, which starts here on Thursday at the formidable Whistling Straits course near Milwaukee. But one week after turning in the worst performance of his professional career – an 18-over par finish at the Bridgestone Invitational in Akron – the prospect of that happening seems somewhat remote. "I was frustrated at the way I hit the ball and the way I putted. I didn't do a whole lot positively around the golf course," he said today, reflecting on that effort. "But I've done some good work over the last two days and I have got one more day of practice ahead. Hopefully, I will be ready come Thursday." Hopefully? Whatever happened to the iron-clad positivity with which Woods used to approach the major championships? Clearly, it has been dissipated by the effects of personal scandal and the steady decline in his play on the golf course. He seems lost, and the evidence of that was to be found on the Whistling Straits course over the past two days. Yesterday he played a round in the company of his caddie, Steve Williams, who appeared to have assumed the role of swing coach. Today he played with Hunter Mahan, the winner at Akron last weekend, and Sean O'Hair. 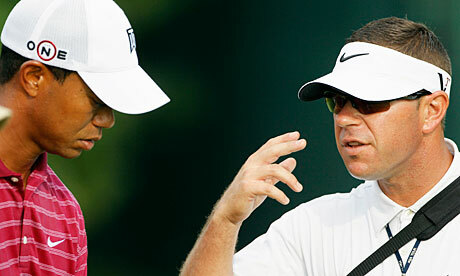 Accompanying them was Sean Foley, who coaches the two younger Americans, and who was at one stage seen filming Woods's swing – refuelling speculation that Foley is about to take on the role that Hank Haney had until May, when he resigned as Woods's coach. "It is a possibility," Foley said afterwards when asked if he and the world No1 might work together. Woods, on the other hand, was more circumspect. "Certainly it's a possibility. But there are a lot of other coaches out there who are a possibility and who I have talked to. I wanted him to take a look at it [the swing] on video and that's what we did." Whatever Foley had to say for himself, it will need to have been good if it is to turn around Woods's game and, more importantly, instil him with the confidence that is so clearly missing.